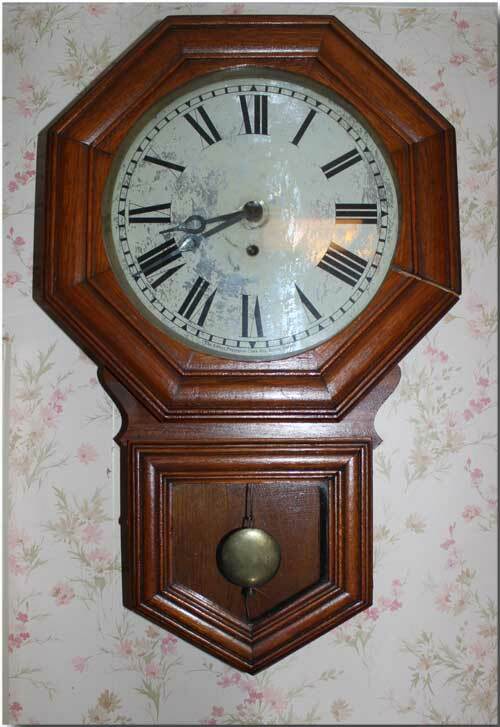 A WALL CLOCK MADE BY THE ARTHUR PEQUENAUT CLOCK CO., BERLIN, ONTARIO BEFORE 1916. THIS IS THE FIRST ISSUE “BRANDON” MODEL. ALL ORIGINAL EXCEPT THAT THE CASE HAS BEEN REVARNISHED AT SOME POINT & SOMES AREAS OF THE FINISH ARE ALLIGATORED. THE ORIGINAL PAPER DIAL ON THE BACK OF THE CLOCK DESCRIBES IT AS A “BRANDON EIGHT DAY OFFICE CLOCK”. 8 DAY, TIME ONLY, ROMAN NUMERALS ON A 10.5 INCH DIAL SIGNED WITH THE COMPANY’S NAME AT THE BOTTOM & WITH SOME WEAR THROUGH THE FACE TO THE STEEL PLATE BELOW. IN EXCELLENT WORKING CONDITION. THIS CLOCK WAS USED IN THE MORNINGSTAR MILL, DECEW FALLS, ST. CATHERINES (NOW A MUSEUM) BEFORE BEING ACQUIRED BY A ST. CATHERINES FAMILY. APPROX. 26.5” H. X 16.5” W. CIRCA 1910.